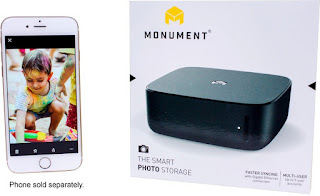 Today ONLY - Monument - Diskless Personal Cloud Server for Photos and Videos $99.99 (Retail $169.99). Use this Monument cloud storage device to organize your photo collection. It sorts them by date, location and image content so you can access individual pictures quickly, and it supports up to five users and unlimited devices, so the whole family can share it. This Monument cloud storage device syncs photos automatically over a Wi-Fi connection.